Armidale Neighbourhood Centre committee members and volunteers, John Marsden, left, Susan McMichael, Lynette Ross, Marian Hargreaves, Manager Robbie Passmore and Northern Tablelands MP Adam Marshall. 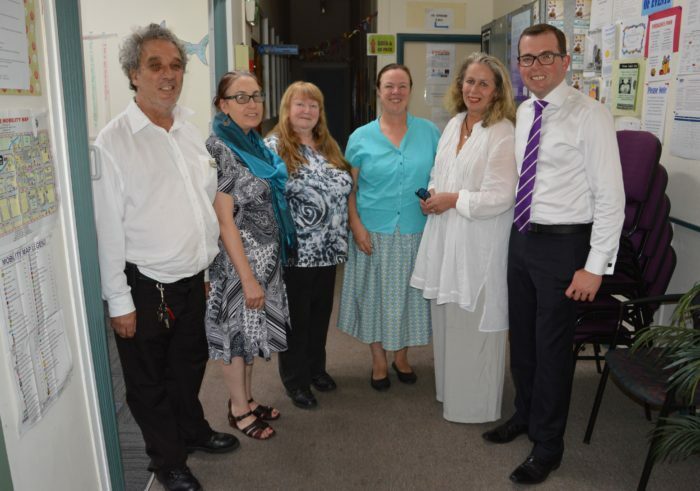 THE Armidale Neighbourhood Centre provides an important service to socially disadvantaged residents and now, courtesy of an $18,236 State Government grant, the premises in Rusden Street is about to receive a very welcome makeover. Announcing the funding today, Northern Tablelands MP Adam Marshall said he had encouraged centre management to apply for the grant last year through the Community Building Partnership Program and due to its obvious merit, had fully supported their application. “The centre occupies part of an old council-owned building that was scheduled for demolition to make way for a new library, however with those plans now on hold, centre management decided to push ahead with a few renovations,” Mr Marshall said. “They are very keen to improve the physical surroundings of the centre to better support and care for the growing number of clients and community members using the space. Mr Marshall said the centre staff and volunteers were a committed and hard working group and he was delighted they would now enjoy more comfortable surroundings while working with clients. Armidale Neighbourhood Centre Manager Robbie Passmore said they were looking forward to installing the air-conditioning units and replacing the carpets and thanked Mr Marshall for his support. “We are endeavouring to upgrade the physical space in order to maximise the use of the room and create an environment that is safe, comfortable and uplifting to those walking through our doors,” Ms Passmore said. “We offer services to anyone, especially those who are socially or economically disadvantaged. We provide No Interest Loans, emergency relief funds, free tax help, free Internet and a needle syringe program. “We also provide information and referrals to services available in the local area regarding disability, health, housing, welfare, emergency assistance and accommodation. “We can help clients fill in forms, write letters and advocate on their behalf with officials.